Lake Reschen (Reschensee / Lago di Resia) is an artificial lake in the western portion of South Tyrol ( Italy), approximately 2 km south of the Reschen Pass, which forms the border with Austria, and 3 km east of the mountain ridge forming the border with Switzerland. With its capacity of 120 million cubic meters it is the largest lake in the province. Its surface area of 6.6 square km makes it also the largest lake above 1,000 m in the Alps. It is fed by the Adige, Rojenbach and Karlinbach and drained by the Adige. 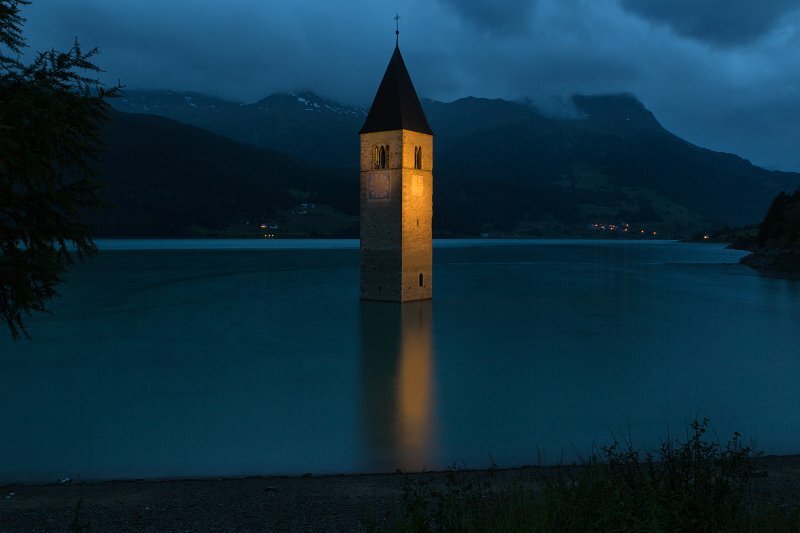 The lake is famous for the steeple of a submerged 14th-century church.